There have been many contenders to the Raspberry Pi’s crown and many of them have disappeared into obscurity. It’s not that they are bad devices but they just haven’t captured peoples’ imagination in the same way as the Pi. The new kid on the block is the BBC Micro Bit. This is a small computing device supported by a large number of well known organisations. Its goal is to promote IT creativity amongst kids and help them develop confidence in our digital world. Sound familiar? That’s the Pi’s turf! In the red and green corner the Pi is weighing in at 45g with external dimensions of 85.60 mm × 56.5 mm. In the black and gold corner the Micro Bit is a mere 8g with external dimensions of 40mm x 50mm. The Pi has mounting holes and proper GPIO pins but the Micro Bit is smaller, lighter with child friendly crocodile clip contacts. In terms of standard specifications the Pi tramples the Micro Bit … but the Micro Bit has onboard Bluetooth, analogue inputs with accelerometer and magnetometer sensors. These would all require additional hardware on the Pi … but it can boast Ethernet, HDMI, camera interface, USB ports and an audio socket in response. The Raspberry Pi has sold 5 million devices. The Micro Bit hasn’t sold a single unit … but in October 1 million of them are being distributed to Year 7 kids in UK schools. That’s 4 million short of the Pi but the killer blow is 1 million are going directly into the class room and straight into the hands of school kids. This sudden momentum could be a game changer. How will this affect the Pi’s footprint in schools? The Pi takes 5V via a microUSB port. This means it can be powered using a massive selection of standard USB based batteries and power supplies. The Micro Bit can do microUSB plus sports an on-board battery connector. This means powering the Micro Bit is easy as pie. Due to it’s size and lack of Ethernet and USB the Micro Bit is almost certainly going to use less power than the Pi. It is rumored to run for 100 hours on two AAA batteries. It’s hard to argue a higher power consumption is better so this round is clear. The biggest jewel in the Pi’s crown is the shear weight of resources and accessories available. Dedicated shops, blogs and forums make the Pi one of the most well loved devices out there. The Micro Bit will have an uphill challenge to build a similar following but it has another power-up to use. It is backed by an impressive list of tech companies who are building a set of supporting material as you read this. They can’t compete on volume but quality counts when it comes to teaching material. A well written lesson plan is more use to a teacher than 10 hobbyist blogs. So that cleared that up. Or does it? One of the supporting organisations is an outfit in Cambridge. You might have heard of them. The are called the Raspberry Pi Foundation. Hang on? Isn’t that like Ivan Drago’s coach handing out oranges to the Italian Stallion? Well that’s where we go back to the Foundation’s Prime Directive. That goal could be met in part by the Micro Bit so they are helping to support it. Secretly I suspect they want the Pi to meet this goal but if something else helps along the way they can at least be proud of being part of the solution whatever the hardware needed to be to achieve it. 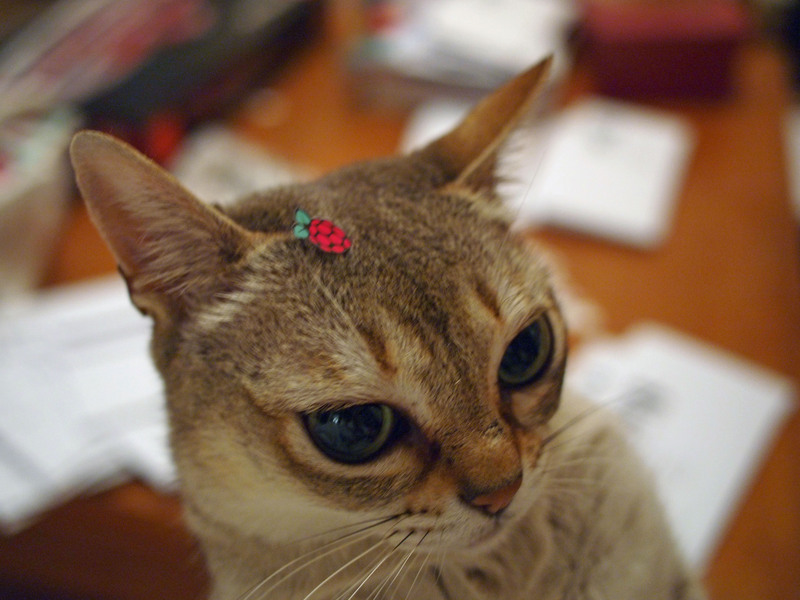 The Raspberry Pi has got Mooncake the cat. The Micro Bit has got nothing. Absolutely nothing. You would have thought between Microsoft, Samsung, ARM and the BBC they could have come up with a cute mascot? So the devices draw. They both landed some blows and are both demanding a rematch. Will the Micro Bit join all the other would-be “Pi Killers” as the Pi continues to dominate the arena? Or will the Micro Bit win over teachers with its brutal simplicity and up-front resources? Or will the two happily co-exist together, mutually supporting similar goals and ambitions? It really boils down to what you expect the device to do. If you are building a media centre, a wildlife camera or a web-enabled robot the choice is clear. The Micro Bit is going to make some projects much easier in the classroom but this is where the teacher is more important than the hardware. Both devices can cover different ground and I can see the Micro Bit acting as a step up to the fuller featured Pi. Only time will tell. So grab the popcorn, pull up a chair and watch the next year unfold. I feel that the main difference between the two devices is that you use a PC to program the BBC Micro Bit where-as the Raspberry Pi can for all intents and purposes be a stand alone computer (and I ended up using one as such for months when my PC burnt out). With additions such as the Fuze case the Raspberry Pi becomes an amazing self contained work station for learning both hardware and software engineering. The BBC Micro Bit on the other hand is unable to (from my understanding) the same and instead appears to target the same education domain as the PIC micro controllers. I imagine you could even use a Raspberry Pi to program a BBC Micro Bit haha! If the crocodile clips are compatible with my alligator clip…I’ll buy it!